Life's Journey To Perfection: LDS Sharing Time August 2014 Week 4: The Sabbath is a day of rest and worship. August 2014 Scripture: “Successful . . . families are established and maintained on principles of faith, prayer, repentance, forgiveness, respect, love, compassion, work, and wholesome recreational activities” (“The Family: A Proclamation to the World”). 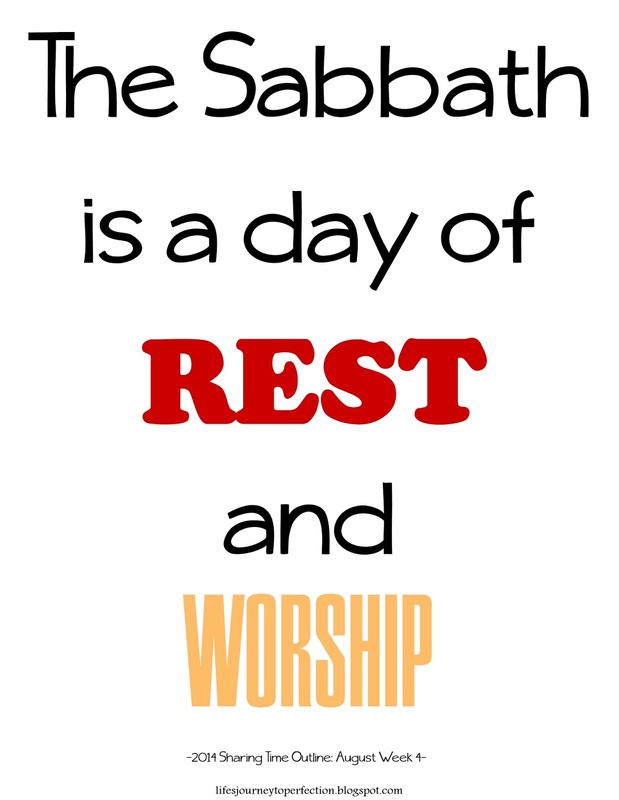 August 2014 Week 4 Topic: The Sabbath is a day of rest and worship. 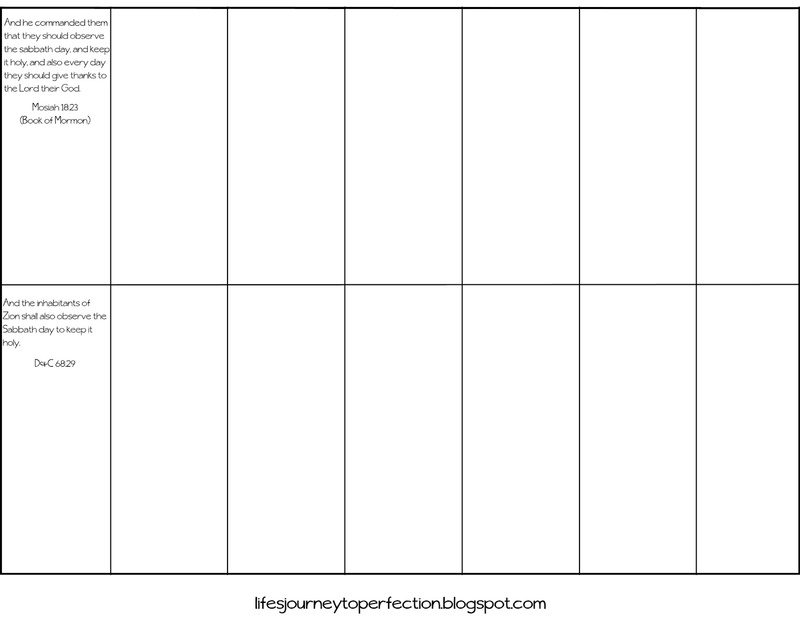 Items to gather: Print out and prepare the printables below. (On pg 2 of theme poster, cut the word strips out just inside of the line, so there is no border). Cut out four pieces of red paper to cover up each scripture on the calendar. Tape the two pages of the calendar together. Chalk and eraser. Scriptures. 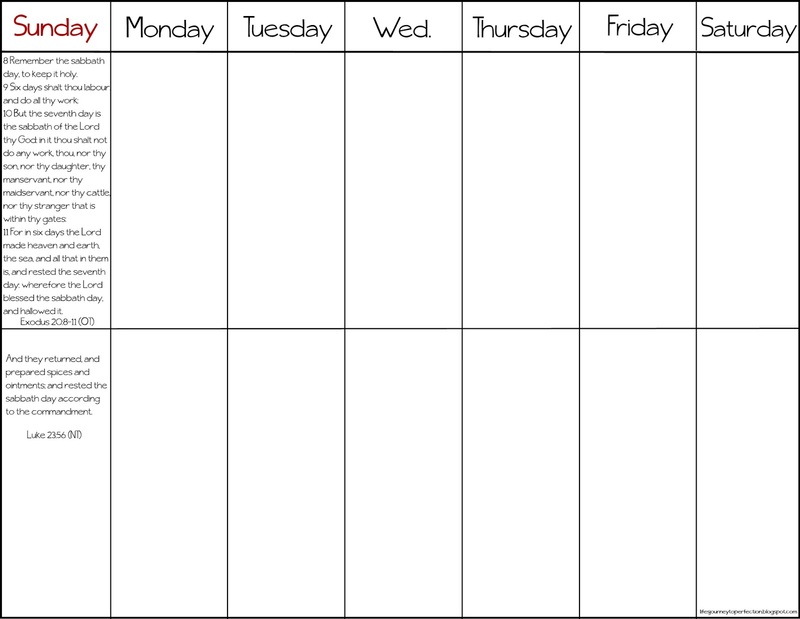 Begin sharing time by displaying a large calendar on the board. Have a red paper placed over each of the Sundays. Under the paper will be a scripture. 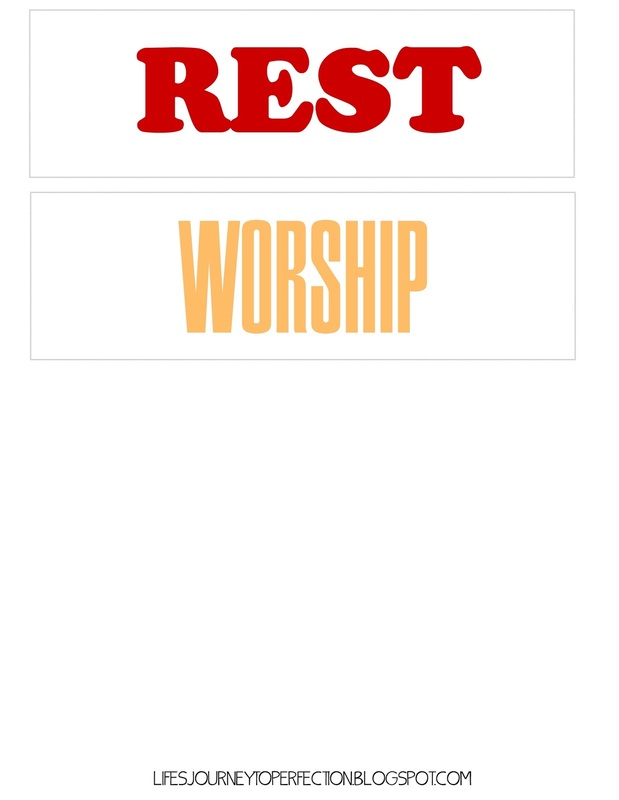 Before Primary place the words "Rest" and "Worship" somewhere in the front of the room. Hold up the poster that states, "The Sabbath is a day of ........ and ........" Invite the children to read the poster with you. Invite a child to find the word "Rest". Have them come up and place it on the poster between the words "of" and "and". Discuss what the word rest means. Explain that it does not mean that we sleep all day. It simply means that we rest from our labors (work). Invite another child to find the word "Worship". Have them come up and place it on the poster after the word "and". Read the rest of D&C 59:10: "and to pay thy devotions unto the Most High". Discuss the scripture and what the word worship means. Explain that Sunday is day we attend our church meetings, partake of the sacrament and participate in activities that will draw us closer to our Heavenly Father. Invite the children to read the completed poster with you, "The Sabbath is a day of Rest and Worship." Point to the calender. Invite the children to count with you how many days are in the week. Start with Monday and count to Saturday. Explain that Heavenly Father created the world in six days. Then point to Sunday, explain that on the Seventh day, Heavenly Father rested. 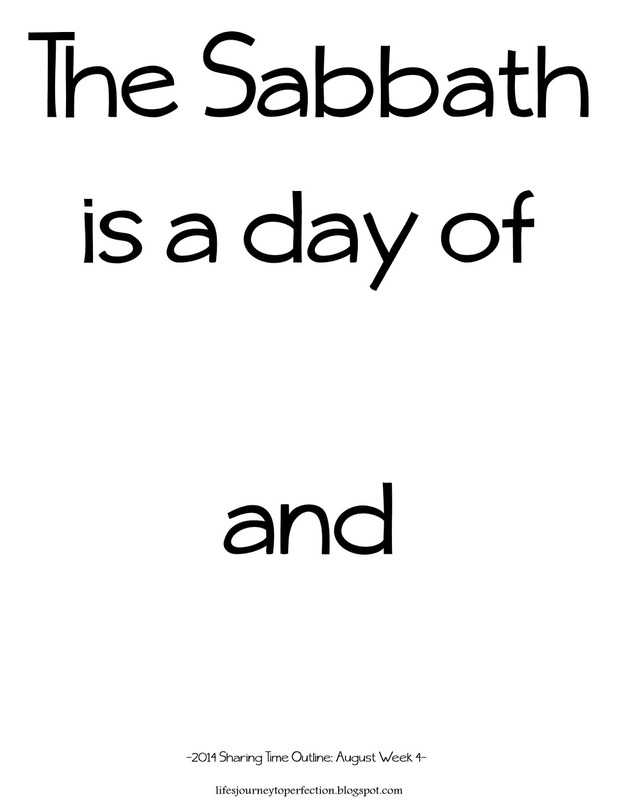 He has commanded his children to also rest on the Seventh day, the Sabbath day and keep it holy. Invite a child to come up and take one of the red papers off of the Sunday and read the scripture. (For Junior primary you could still have them come up and take the red paper off and if they can not read then you could read the scripture for them.) Continue until all of the scriptures have been read. Point out as you go where the scripture is found, and who the principle is being taught to. Explain that each of these scriptures are teaching the same principle even though they were written at different times in history. Invite the children to tell you some activities that would be appropriate to participate in on the Sabbath to keep it Holy. List these ideas on the board. Thank you Anne, your comment mean a lot! I always stress out about doing sharing time. I'm a high school teacher and not used to working with small children at all! This idea was so helpful. I love that you stick to the outline but make it come alive. Thank you!